Relax and stroll down tropical fairways surrounded by island flowers and grass huts. It's a plush, new volcanic country club full of pineapples and palm trees! 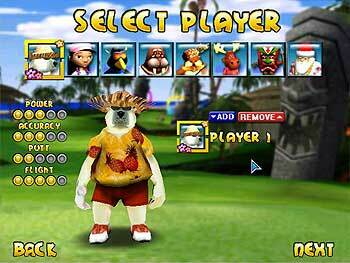 Characters you met and clicked with in Polar Golfer are back in the Polynesian-style sequel. Yell 'FORE' from fairways filled with molten lava and giant tiki heads. Ocean hazards and erupting volcanoes make this course challenging and fun. 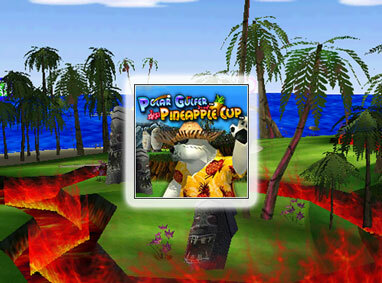 Swing with one paw and send your golf ball sailing over scorching lava rock! Reunite with Polar Golfer's friends: Walrus, Gopher and Santa and meet all-new, comical characters like Hula Girl and Tiki Guy. Improve your score with power rings that keep you sailing in the right direction!